This listing is for one Gold Fingers Working. This is a service I perform on your behalf. Gold Fingers workings are used to quickly increase luck, employment opportunities, prosperity, business and winnings. ***PLEASE ALLOW 7 DAYS FOR THE FULL PROCESS AND REPORT OF THE WORKING. THIS ENSURES THERE IS ADEQUATE TIME FOR COMPLETION AND DISPOSAL OF THE WORKING. 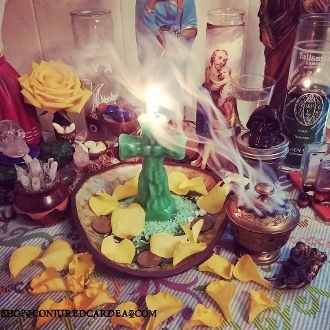 This service includes a loaded, dressed and fixed candle which is burned on my altar, along with the corresponding oil, incense, roots and powder. Rootwork is a type of spiritual assistance and exercise. There is no one type of assistance that will work for 100% of the people who attempt to utlize it. A full report containing 5-10 photos will be emailed when the work is close to completion or upon completion. ****************Please provide names, DOB and the details of your situation as well as you goals in the "special instructions" area on your order form. Photos should be e-mailed to conjuredcardea@gmail.com YOUR ORDER WILL BE CANCELED IF NO INFORMATION IS PROVIDED! *Spiritual work is never guaranteed. Just with any professional service, such as a lawyer or counselor, providing a professional service does not gurantee your situation with be met with your anticipated goals, in your anticipated amount of time.